Benefit from the most competitive rates for taxis in Scotland. 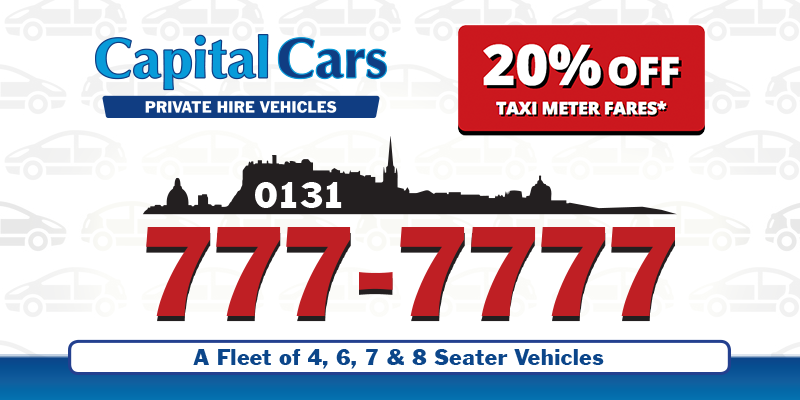 At Capital Cars, all of our vehicles count with a meter set to the standard taxi rate in Edinburgh. At the end of the journey, we will deduct 20%* from the total and you will pay the discounted rate. Whatever the price on the meter at the end of the journey , we discount it by 20%*. So if the fare is £10 on the meter, we discount it by £2 and so you only pay £8. Any metered journey you want. These include airport drops offs only, shopping trips, local runs & nights out. Your driver will automatically offer you the 20% discount at the end of your journey. If he does not, please remind him. Your driver will automatically offer you the 20% discount at the end of the journey. If he does not ,please remind him. Definitely! You can see what you are saving compared with the standard taxi tariff. Try us and see how much you save. At Christmas and New Year. Only applies to metered fares not set fares. Only applies to fares paid by cash or credit card. Maximum discount is £4 per journey. If a third party books on your behalf , the discount may not apply. Please check directly with the third party to clarify.